As little as a year or so ago, Bryston’s James Tanner said the company would never offer a turntable and now here we have the BLP-1, Bryston’s first turntable and tonearm. Tanner himself stepped right up to the contradiction: “As we set out to design the newest Bryston phono preamplifier models BP-2MM and BP-2MM/MC, the wide bandwidth and low distortion of our new gain stages reminded us of how breathtaking and fresh high-resolution vinyl playback could be. With the BLP-1, we have created a turntable that represents premium performance to supplement our lineup.” In other words, the company’s new turntable exists to demonstrate the excellence of its new phonostages. Really? I’d have thought record-playing gear from the likes of Basis, SME, Graham, SOTA, Clearaudio, Well Tempered, Acoustic Signature, Brinkman, VPI, and numerous others more than adequate to that task. Let’s get real. While vinyl is a niche market and almost certain to remain so, it happens at the moment to be a niche market that is both large and growing. Best Buy now sells sixteen integrated turntables. Granted, few if any of them are exactly high end or even audiophile grade, but still. And most of the remaining big record labels now routinely offer a limited vinyl run of their most popular artists (which my local Best Buy also stocks). Plainly Bryston wants in on the action, and why not? 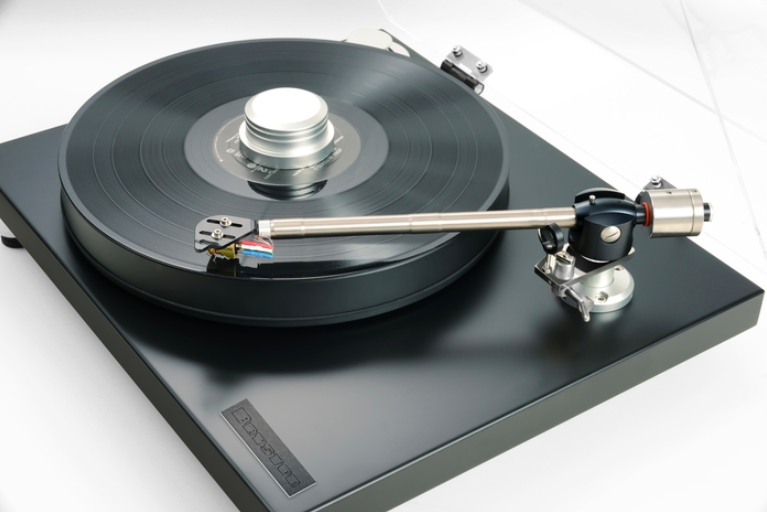 Several audio manufacturers have introduced or re-introduced integrated turntables into their lines, including McIntosh, Marantz, Luxman, Technics, and Denon. The reason is obvious: Many audiophiles are brand loyalists. Bryston has a reputation that would be the envy of any manufacturer for high-level electronics that are superbly designed, ruggedly built, and boast state-of-the-art performance at prices that, while not cheap, are certainly reasonable (everything the company sells comes with an industry-standard-setting guarantee of twenty years, so reliability is a non-issue). No doubt there are a great many Bryston owners who will get themselves into vinyl—or back into vinyl—just because a turntable and a tonearm wear the Bryston badge. And “badge” is the operative word. Like most other electronics manufacturers who’ve never offered vinyl products before, Bryston has gone the badge-engineering route, that is, commissioned a turntable-and-’arm combination from a manufacturer with long experience in manufacturing same, in this case the Italian manufacturer Gold Note. If the turntable is once removed from Bryston, the tonearm is twice so inasmuch as Gold Note sources it from the German manufacturer GRM. It’s a gimbal-bearing design with a nine-inch titanium tube that is constructed in seven segments of differing diameters—the better to suppress, break up, or otherwise deal with unwanted resonances. Wiring is oxygen-free copper, two counterweights of different sizes allow for correct balancing and tracking force of any pickup likely to be used with it, and there are provisions for azimuth height and azimuth adjustment. A close look at the picture will reveal another unusual feature or rather lack thereof: no anti-skating (see sidebar for more on this). The chassis-mounted synchronous motor is driven by the BTP-1, an outboard pulse-width-modulation power supply wholly designed and manufactured by Bryston itself. On/off, 33/45 speed selection, and speed (i.e., pitch) control are all front-panel accessible. Bryston claims the BTP-1 makes for exceptionally accurate absolute speed and speed constancy. I checked the accuracy with a strobe disc and it was spot on and never varied throughout the evaluations. Apart from pickup installation and alignment, setup is principally a matter of unpacking, inserting the spindle, and putting on the platter. Even the dust cover is factory attached and can be removed only with a screwdriver, suggesting Bryston and Gold Note feel it should be left on. While it will stay up at virtually any height, it cannot be closed while an LP is playing. Vertical clearance is sufficient, but about halfway across a record the counterweight bumps into the side. A template is provided to set stylus overhang and offset angle. I can truthfully state that it took me no longer than about ten minutes to install and align the pickup—a trusty Ortofon Windfeld, my longstanding reference these last several years, and the whole process from opening the box to playing music around 25 leisurely minutes. Associated equipment included Musical Surroundings Phenomena II phonostage, McIntosh C52 preamplifier, the built-in phono section of the C52, Pass Labs X150.8 and Quad Stereo amplifiers, Harbeth Monitor 40.2 speakers, and cables and interconnects by AudioQuest and Kimber. When I listened to music two impressions immediately struck me. The first was of exceptionally precise timing and articulation of rhythm. Perhaps I was overly influenced by the point Bryston makes about the speed precision and constancy due to the outboard power supply, but the sense of ensemble “togetherness” on attacks and releases is unusually persuasive. (Bear in mind that my daily reference is a truly stellar setup, Basis’s 2200 turntable and Vector IV ’arm.) Any number of jazz albums will reveal this timing, including a couple of old friends. On the Sheffield direct-to-disc classic The Name Is Makowicz, the pianist Adam Makowicz and the legendary saxophonist Phil Woods launch into a stunning riff on “You Do Something to Me” that is furious and even frenzied without ever losing control. The BLP-1 matched the performers every step of the way. The other classic is Bernstein’s first The Rite of Spring, from 1958, which Sony has reissued on 180-gram vinyl in addition to a digitally remastered compact disc. On fire himself, Bernstein set the orchestra ablaze too—go directly to “Dance of the Earth” for an object lesson in how a conductor knows how to push his players to the absolute brink of speed and rhythmic intensity but no farther. The other impression that struck me forcibly was the strength and power of the bass. I have what some might call a weird prejudice when it comes to small, lightweight, non-suspended turntables, those exemplified by Rega and its derivatives, namely: They never seem to me to be capable of the kind of bass weight and foundation that physically larger turntables and/or those with tuned suspensions are capable of reproducing. There’s also a corollary to this that is probably related: These light fixed-plinth turntables always have to my ears a certain difficult-to-define but very real “drummy” coloration. The reason for this seems to be obvious: the light plinths, which are typically made from MDF, wood, or some synthetic, cannot help but respond sympathetically when lots of bass energy is poured into a listening space. Indeed, they behave rather like a musical instrument in that way. Tuned suspensions filter this sort of thing out, while more sophisticated non-suspended designs often use combinations of materials for damping (constrained-layer is one of the more popular). So the first thing I played on the Bryston/Windfeld setup was Impex’s reissue of the Gould/Bernstein Beethoven Fourth Piano Concerto, beginning with the slow movement, which opens with all the strings playing a powerful descending motif that Bernstein essays with Klempererian weight and deliberation, doublebasses especially present and potent. This is followed by the piano with a meditative, even calming motif (an early biographer of composer’s rather fancifully imagined Orpheus taming the furies). The BLP-1 rendered this opening with a commanding sit-up-in-your-seat power and involvement, and no drumminess that I could readily discern. I suspect there’s something to those slots that help reduce the resonances of the plinth (perhaps by redistributing them to a frequency range where they’re less noticeable? ).